Programmable Meter Multiplier – the MPG-1 now has the capability to have the meter multiplier programed into it to make it fully compatible with instrument-rated electric meters as well as self-contained electric meters. 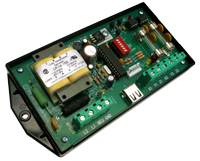 Delivered and Received Energy – the MPG-1 can provide pulses for both positive (delivered) and negative (received) energy for bidirectional power applications. .
Communications Port for Programming and Monitoring – the MPG-1 now contains a serial communications port for programming system parameters as well as monitoring the Zigbee communications with the meter. The MPG-1 allows the utility to provide KYZ pulses to a customer and maintain their standard AMI meter rather than having a non-standard meter deployed just for KYZ pulses.